Few days back, one of my reader had requested for this recipe. So far I have tried making many types of prawn/fish pulavs. But I always loved this delicious prawn pulav from my Aayi. It is very simple to make, yet amazingly tasty. When we were kids, my brother and I always loved this. As we grew up, somehow this pulav was forgotten, though we still can feel the taste of green pulav, peas pulav. Few days back, when I was talking to her, she mentioned this. I was very hesitant to try it because of my previous experiences with not-so-great-tasting prawn pulavs. But now I am happy that I tried it. It is much easier to make and very tasty. Pulavs are not very popular at my native. People do not consider them as a ‘meal’. But aayi and my maternal grandmother made pulavs very frequently. We loved them then and we love them now. Heat oil and add onion, ginger, chillies. Then add spices. Add tomatoes and cook till they are mushy. Add shrimp. Add coriander leaves. Mix. Then add cooked rice and mix well. 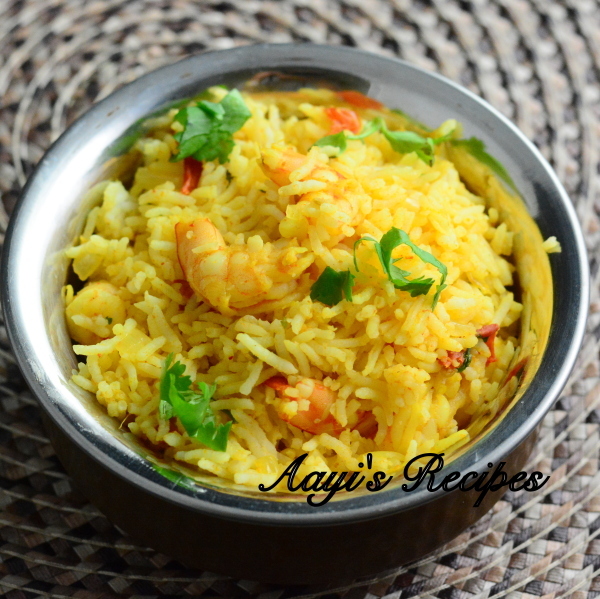 A simple very fragrant prawn pulav (pilaf) made with few spices and fresh coriander leaves. Cook rice (each grain should be separate. Pulav does not taste great when it becomes mushy). 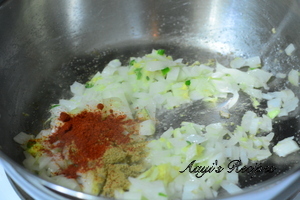 Heat oil, fry onion, finely chopped (or grated) ginger till they turn slightly brownish. 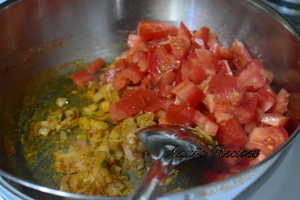 Add chili powder, turmeric, coriander powder, chopped tomatoes, salt and fry for a 2-3mins. Add prawns and cook till they are done (or cook prawns separately and add). Add cooked rice mix well. Hi- I made your eggless date cake. It turned out wonderful and was even better after a day. Thanks for the recipe. D, the coriander powder and prawns make a huge difference in taste. Thanks a lot Mika. Happy to know you liked it :D.
looks really yummy and simple. will try it soon. thanks. so nice.can i ask u something,u r not adding garlic is anything specific. Shilpa: Deepa, the recipe did not call for garlic, nothing specific about it. Just one query. 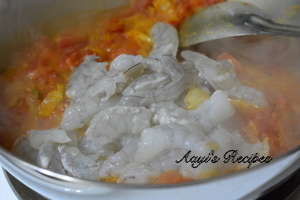 Do you not fry the prawns in turmeric and red chilli powder before adding it to the onion tomato mixture. Shilpa: Venessa, as I have mentioned in the method, either you can cook prawns in water and add to the onion mixture or you can add them after onions are fried and allow 1-2mins till they become white. Tried this recipe today..Just one word.. Awesome! U have created a gr8 site. Tried the prawn pulao and it came out really good. 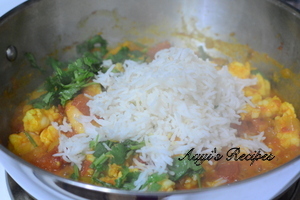 Hey Shipla, I tried the receipe for Prawn pulav yesterday and it tasted realy good. Thanks ! Hi Shilpa, your website is a great one as I keep on coming back for different recipes from time to time. Just had a pooja at home and lots of your recipes came handy as at home we don’t always cook amchi food (my husband is not a great fan) but this one he loved it. I even used this recipe to cook chicken pulav, just added some shaan masala in the end and that turned out great too. Keep these gems coming for us. Great work. Hi Shilpa, came across this site by luck…made this dish last night and it was veryyy testy 🙂 thanks a lot for such a helpful and amazing site ! Hey, in the above recipe… u have accidentally mentioned to add chili powder twice. hahaha…. im sjure that wud be disastrous if anyone actually did literally follow the typing error. Pls correct the same. Shilpa: Thanks for pointing out mistake. Updated. 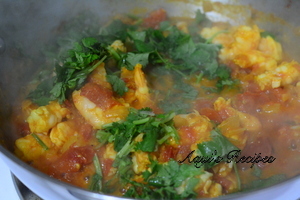 Wow, the cooking method of this prawn pulav is great, I’ll try it later and I hope it tastes the way it look. Thanks for sharing! I had some guests the other night for dinner.I tried your prawn pulav,chicken sukka,panner butter masala and amti ….all was very much appreciated and loved..Kudos for your good work.. I suggest the prwans to be marinated before sauteing (marinade – pinch of chilli powder, pinc of turmeric, salt and either lemon or vineger) , also garlic can be added to it. tried this recipe turned out very nice…. my husband loved it!!! I added 1/2 cup coconut milk & it enhanced the flavor. Wonderful Blog and fabulous recipes. Could You kindly suggest me some serving suggestions with this Prawn Pulao for a holiday lunch menu? This is a fantastic and easy recipe! Love the dish. I have just try this recipe… taste is good. hello …is this not fried rice, where u cook the rice separately and then add the veg or meat or prawns? 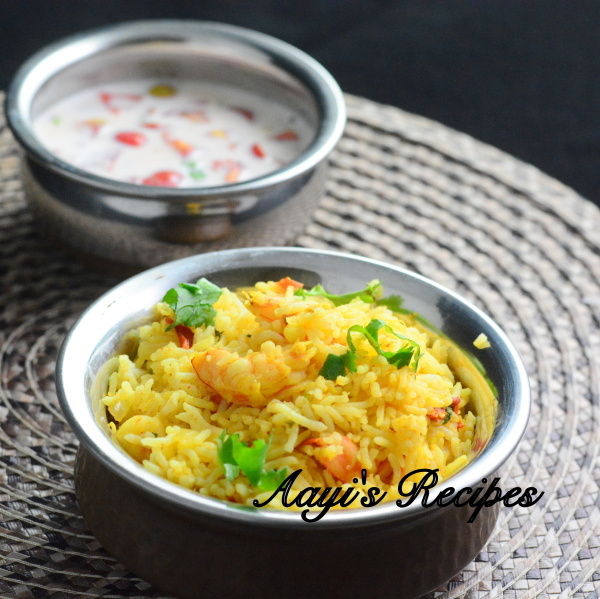 ..pulao is when u cook all the ingredients together …..At least thats what I have learnt! Shilpa I love to browse your recipes They are superb I tried your Ragi Dosa it came out very well Ur Prawns Pulao I will definitely try. After boiling the prawns in water, some of the water is left. Do we have to throw out the remaining water or add it in the end along with the prawns? 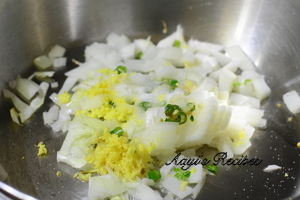 You can use it to make rice or add along with prawns(which may make the pulav mushy). I made this today for my hubby’s lunch. It was yummy. 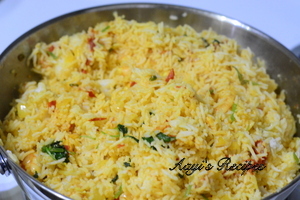 Thanks for the easy and tasty pulao recipe.